Barazesh, Mohammad, Motavalli-Anbaran, Seyed-Hani, Ghorbanian, Hojjat. (1394). Application of surface-derived attributes in determining boundaries of potential-field sources. مجله ژئوفیزیک ایران, 9(5), 57-71. Mohammad Barazesh; Seyed-Hani Motavalli-Anbaran; Hojjat Ghorbanian. "Application of surface-derived attributes in determining boundaries of potential-field sources". 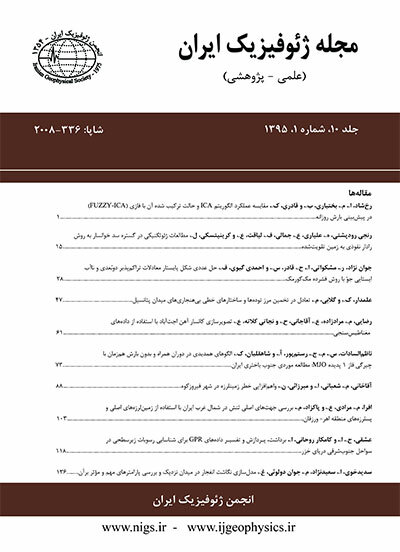 مجله ژئوفیزیک ایران, 9, 5, 1394, 57-71. Barazesh, Mohammad, Motavalli-Anbaran, Seyed-Hani, Ghorbanian, Hojjat. (1394). 'Application of surface-derived attributes in determining boundaries of potential-field sources', مجله ژئوفیزیک ایران, 9(5), pp. 57-71. Barazesh, Mohammad, Motavalli-Anbaran, Seyed-Hani, Ghorbanian, Hojjat. Application of surface-derived attributes in determining boundaries of potential-field sources. مجله ژئوفیزیک ایران, 1394; 9(5): 57-71. This paper describes an edge detection method based on surface-derived attributes. The surface-derived attributes are widely used in the interpretation ofseismic datain two main categories: (1) derivative attributes including the dip angle and the azimuth; (2) derivative attributes including curvature attributes. In general, the magnitude of the normal curvature of a surface (curvature attributes) can be expressed in terms of derivatives of that surface which are called the first and second fundamental forms of the surface. For a quadratic surface which fits data, it is shown that the dip-angle equation in the interpretation of the seismic data is similar to the horizontal gradient magnitude (HGM) equation in the interpretation of potential field data. Among the infinite number of curvature attributes, a few of them which are suitable for edge detection are shown. The coefficients of a quadratic surface are calculated using the least square method. At a particular point, the attributes are obtained using these coefficients. Zero contours of most positive curvature and the determinant of the curvature matrix delineate the location of the edges of anomalies. Theshape indexattributequantitatively reflects the local shape of the surface over sources in terms of cap, dome, ridge, saddle, rut, trough and cup.Here, the maximum curvature is introduced as a new technique to detect the horizontal location of anomalies. First, the introduced attributes were applied to the noise-free synthetic data. Then, the data with the noise added were used to check the stability of the method. In the presence of high-level noise, this method was successful in determining boundaries of the anomalies.Zero contoursof the most positive curvature, the determinant of curvature matrix and the maximum curvature properly illustratethe linear features within the mapped surface. The results of using surface-derived attributes were compared with tilt angle and HGM filters. This comparison showed that zero contours of the most positive and maximum curvature attributes are approximately matched with zero contours of the tilt angle and maximum values of HGM. Finally, this method was used for real data from Mobrun massive sulfide ore of Canada.MATLAB softwarewas used for programming and calculating the required parameters of this method. This paper describes an edge detection method based on surface-derived attributes. The surface-derived attributes are widely used in the interpretation ofseismic datain two main categories: (1) derivative attributes including the dip angle and the azimuth; (2) derivative attributes including curvature attributes. Â Â In general, the magnitude of the normal curvature of a surface (curvature attributes) can be expressed in terms of derivatives of that surface which are called the first and second fundamental forms of the surface. For a quadratic surface which fits data, it is shown that the dip-angle equation in the interpretation of the seismic data is similar to the horizontal gradient magnitude (HGM) equation in the interpretation of potential field data. Among the infinite number of curvature attributes, a few of them which are suitable for edge detection are shown. The coefficients of a quadratic surface are calculated using the least square method. At a particular point, the attributes are obtained using these coefficients. Zero contours of most positive curvature and the determinant of the curvature matrix delineate the location of the edges of anomalies. Theshape indexattributequantitatively reflects the local shape of the surface over sources in terms of cap, dome, ridge, saddle, rut, trough and cup.Here, the maximum curvature is introduced as a new technique to detect the horizontal location of anomalies. Â Â First, the introduced attributes were applied to the noise-free synthetic data. Then, the data with the noise added were used to check the stability of the method. In the presence of high-level noise, this method was successful in determining boundaries of the anomalies.Zero contoursof the most positive curvature, the determinant of curvature matrix and the maximum curvature properly illustratethe linear features within the mapped surface. The results of using surface-derived attributes were compared with tilt angle and HGM filters. This comparison showed that zero contours of the most positive and maximum curvature attributes are approximately matched with zero contours of the tilt angle and maximum values of HGM. Finally, this method was used for real data from Mobrun massive sulfide ore of Canada.MATLAB softwarewas used for programming and calculating the required parameters of this method. Barraud, J., April 2013, "Improving identification of valid depth estimates from gravity gradient data using Curvature and Geometry analysis," First break, Volum 31. Bergbauer, S. 2002, The use of curvature for the analyses of folding and fracturing with application to the emigrant gap anticline, Wyoming: Phd. thesis, Stanford university. Cevallos, C., kovac, p., lowe, s. j., 2013, “Application of Curvatures to airborn gravity gradient data in oil exploration,”Geophysics,VOL.78,NO.4. Cooper, G. R. J., and D. R. Cowan, 2003, The application of fractional calculus to potential field data: Exploration Geophysics, 34, 51 –56. Grant, F. S., and West, G. F., 1965, Interpretation theory in applied geophysics, McGraw-Hill. , 70, 39-43. Grauch, V. J. S., and L. Cordell, 1987, Limitations of determining density or magnetic boundaries from the horizontal gradient of gravity or pseudo gravity data: Geophysics, 52, 118 –121. Hansen, R. O., and E. deRidder, 2006, Linear feature analysis for aeromagnetic data: Geophysics, 71, no. 6, L61 –L67. Marfurt, K. J., 2007, Seismic Attributes for Prospect Indentification and Reservoir Characterization: Society of Exploration Geophysics. Miller, H. G., and V. Singh, 1994, Potential field tilt — A new concept for location of potential field sources: Journal of Applied Geophysics, 32, 213 –217. Nabighian, M. N., 1972, The analytic signal of two-dimensional bodies with polygonal cross-section — Its properties and use for automated anomaly interpretation: Geophysics, 37, 507–517. Oruç, B., I. Sertçelik, Ö. Kafadar, and H. H. Selim, 2013, Structural interpretation of the Erzurum Basin, eastern Turkey, using curvature gravity gradient tensor and gravity inversion of basement relief: Journal of Applied Geophysics, 88, 105 –113. Plouff, D., 1976, Gravity and magnetic fields of polygonal prisms and applications to magnetic terrain corrections: Geophysics, 41, 727–741. Phillips, J. D., R. O. Hansen, and R. J. Blakely, 2007, The use of curvature in potential-field interpretation: Exploration Geophysics, 38, 111 –119. Roberts, A., 2001, Curvature attributes and their application to 3D interpreted horizons: First Break, 19, 85–100. Roy, L., Agarwal, B. N. P., and Shaw, R. K., 2000, A new concept in Euler deconvolution of isolated gravity anomalies: Geophysical Prospecting, v. 48, no. 3, p. 559-575. Santos, D. F., J. B. C. Silva, V. C. F. Barbosa, and L. F. S. Braga, 2012, Deeppass — An aeromagnetic data filter to enhance deep features in marginal basins: Geophysics, 77, no. 3, J15 –J22. Verduzco, B., J. D. Fairhead, C. M. Green, and C. MacKenzie, 2004, New insights to magnetic derivatives for structural mapping: The Leading Edge, 23, 116 –119. Wijns, C., C. Perez, and P. Kowalczyk, 2005, Theta map: Edge detection in magnetic data: Geophysics, 70, no. 4, L39 –L43.